Back in 1994, "America's Sweetheart" Meg Ryan wowed audiences with her dramatic turn as an alcoholic housewife, whose marriage was pushed to the brink of despair as her addiction spiraled out of control. This year, one of Hollywood's most best kept secrets, Mary Elizabeth Winstead, takes on a similar role as a wife whose alcohol-infused shenanigans lead to an early mid-life crisis, which consequently shakes up her marriage in Smashed. Winstead stars as Kate Hannah, a young teacher who starts most days rolling out of bed next to her nearly comatose husband Charlie (Aaron Paul, of TV's Breaking Bad) just minutes before the school bell rings. She pats color into her face, knocks back a bottle of beer, and sets out on her day. It all seems to be working out enough for her, until her wild nights start to slur with purely disastrous days, sending both her personal and professional life into a tailspin. She decides to give up booze altogether, and for the first time she's seeing her life with eyes wide open, which reveals a feeble relationship with her persistently bar-hopping husband. It's certainly not as much of a showy performance as Ryan's was, but the quieter moments when Winstead allows Kate to come to terms with herself (like when she makes her first speech of admission in front of a group at an Alcoholics Anonymous meeting) are ones that will stick with you most. This will most impress audiences that never get the chance to see the actress take on a role with so much depth. In addition, Paul's parallel performance with Winstead's will make you want to shed a tear toward the end of the film. His beloved has drifted away from him to clean up her life, while he desperately clings to their deteriorating relationship with the hope that she'll slide back into his arms. It's a heartbreaking position to be in, especially when he discovers that he may be more of a detriment to Kate than he wants to admit. 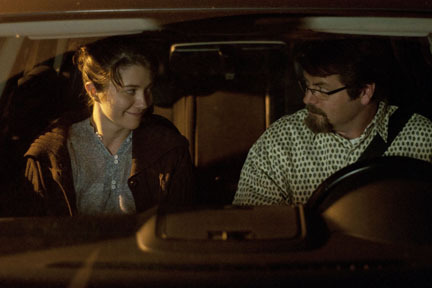 While writer/director James Ponsoldt's screenplay tends to saunter along at times as it seeps further into starkness, Winstead and Paul's performances will keep you engaged until the end. Capturing the essence of a true indie darling, Smashed picked up the U.S. Dramatic Special Jury Prize for Excellence in Independent Film Producing from Sundance earlier this year. It doesn't really cause as much of a stir as other films have this year, and perhaps others to come before the year's end, but Smashed does feature a pair of ace performances from both Paul and Winstead (and effectively delicate portrayals from supportive cast members Megan Mullally, Octavia Spencer and Nick Offerman). I'll drink to that. Smashed is now playing in limited release. Great review! I want to see this so bad. I've been a fan of Mary Elizabeth Winstead for a good while and Aaron Paul is just generally impressive on Breaking Bad so no shock about that translating to the big screen. This film sounds like it hits all the right notes, really hope to catch it before it finishes it's run. Great review. Can't wait to see this one. Love Aaron Paul in Breaking Bad. Mary Elizabeth Winstead is a terrific actress in my book...when I heard about this one I hoped it would be as good as people were saying it could be. Glad it's worthwhile viewing!